So you KonMari’d your entire wardrobe and said goodbye to all of your old spring clothes. But now you have nothing seasonal to wear...what to do? Don’t worry, even the queen of tidying up herself can’t resist a refreshing shopping spree—as long as it’s happy and practical. 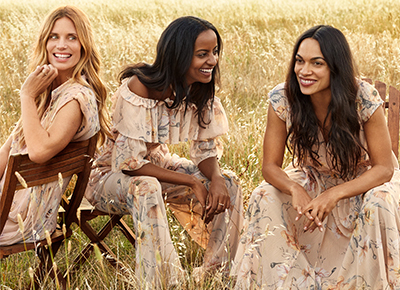 We teamed up with Old Navy to give you just that: a roundup of five spring trends guaranteed to bring you all the joy every time you wear them. Hallelujah, our legs can finally breathe again! The midi is our favorite length for combating sneaky spring winds, and it looks just as cute with a warm cardigan as it does with sunglasses and sandals. A springy floral print on a black background makes this dress appropriate forMarch or May. Pops of trendy neon are fun, but for bigger splashes of color we prefer pretty, washed-out versions of those vibrant shades. Dusty rose, cornflower blue and sage green forever. Note the tie front on this top, which makes the button-up silhouette more weekend friendly. Fresh blooms are pretty, but they’re so much more fun when you can wear them. The dainty buds and blossoms on this little yellow number are guaranteed to bring a smile to your face all season. We’re all about that flirty flounce this spring, and the sleeve detail of this shirt is just fluttery enough to complement the colorful butterfly print (which we’re loving). Few things bring us more joy than a lazy-gal hack, which makes the one-and-done jumpsuit one of our ultimate wardrobe staples. Let this chambray version steal the spotlight by pairing it with all white accessories for a chic spring look that’s easy and on trend (our two favorite things).